Dutch studios NL Architects and XVW Architectuur have won this year's Mies van der Rohe Award for their innovative renovation of a dilapidated 1960s apartment block on the edge of Amsterdam. 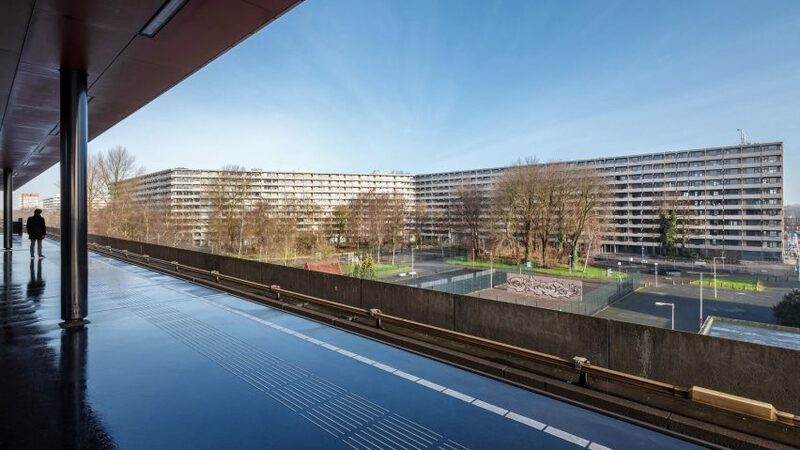 NL Architects and XVW Architectuur's restoration project, named deFlat, rescued one of the Netherlands' largest housing blocks from demolition – a fate facing much of Europe's post-war housing. The do-it-yourself concept behind the project saw the architects refurbish structural and communal areas, but left the inhabitants to oversee the fit-out of their individual homes. British practice OMMX recently proposed a similar scheme for north London known as Naked House. The Kleiburg apartment building – a colossal, 400-metre-long block containing 500 apartments over 11 storeys – is one of several blocks laid out in a hexagonal plan to form an estate to the southeast of Amsterdam. DeFlat was selected as the winner of the Mies van der Rohe Award 2017 from a shortlist of five projects, including a British housing scheme, museums in Denmark and Poland, and a memorial in France. The prize, which is named after German-American architect Ludwig Mies van der Rohe, is the most prestigious accolade in European architecture. A prize pot of €60,000 (approximately £51,000) is awarded for the best building completed in the last two years by a European architect. NL Architects and XVW Architectuur will be presented with the award in a ceremony held at the Mies van der Rohe Pavilion in Barcelona later this month. Past recipients of the award include Barozzi Veiga's Szczecin Philharmonic Hall in Poland (2015), the Harpa Concert and Conference Centre in Iceland (2013) and David Chipperfield's Neus Museum in Berlin (2011).